Definition at line 1373 of file Stmt.h. Definition at line 1385 of file Stmt.h. Definition at line 1390 of file Stmt.h. Definition at line 1410 of file Stmt.h. Definition at line 1407 of file Stmt.h. Definition at line 1399 of file Stmt.h. Definition at line 1609 of file Stmt.h. Definition at line 1397 of file Stmt.h. Definition at line 1393 of file Stmt.h. 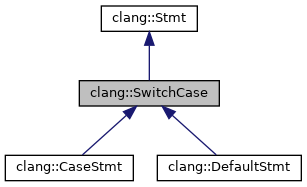 Referenced by clang::SwitchStmt::addSwitchCase(), clang::Sema::CodeCompleteCase(), and EvaluateSwitch(). Definition at line 1394 of file Stmt.h. Definition at line 1617 of file Stmt.h. Definition at line 1403 of file Stmt.h. Definition at line 1400 of file Stmt.h. Definition at line 1398 of file Stmt.h. Definition at line 1395 of file Stmt.h. The location of the ":". Definition at line 1376 of file Stmt.h. A pointer to the following CaseStmt or DefaultStmt class, used by SwitchStmt. Definition at line 1383 of file Stmt.h.